in stocking stitch on 3.75 mm needles after blocking. Gauge: 22 sts & 36 rounds = 10 cm / 4” over st st on 3.75 mm needles after blocking. 20 sts & 36 rounds = 10 cm / 4” over lace on 3.75 mm needles after blocking. in the round. Always use a needle size that will result in the correct gauge after blocking. O’Keeffe is worked in the round from the top down with raglan shaping. 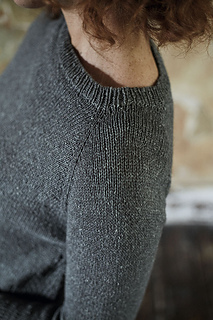 Short rows at the beginning of the raglan shaping add height to the back neck. After the yoke is complete, the body and sleeves are separated and worked down. Lace panels are gradually introduced in the body, which is then finished with ribbing. The sleeves are worked in stocking stitch and finished with ribbing.